Born about 19064,5,6 [about 19047, about 18901], Indiana4,5,6. He married Evelyn Marie Jones, Aug 9 1925, Wilmington, New Castle County, Delaware.7 Evelyn, daughter of John Harry Jones & Ella Wilhelimina Bartlett7,8, was born Jan 18 19067,8 [about 18951], Delaware7,8. Henshaw, John, head-of-household, age 40, born in Delaware; parents born in Delaware; first married at age 34; rented home ($28 rent); radio in home; occupation: cement worker, construction; not a war veteran. Henshaw, Evelyn, wife, age 35, born in Delaware; parents born in Delaware; first married at age 29. Henshaw, Dorothy, daughter, age 4 years 6 months, born in Delaware; parents born in Delaware. Henshaw, Jaqueline, daughter, age 1 year 4 months, born in Delaware; parents born in Delaware. Simpson, Ada, lodger, age 56, born in Maryland; father born in Pennsylvania; mother born in Maryland; widow, first married at age 36; occupation: none. Hinshaw, Evelyn M., head-of-household, age 34, born in Delaware; completed 4th grade; on Apr 1 1935 was living in the same place/city; divorced; rented home ($12/month rent). Hinshaw, Dorothy L., daughter, age 13, born in Delaware; completed 6th grade; on Apr 1 1935 was living in the same place/city; attended school. Hinshaw, Jacqueline, daughter, age 11, born in Delaware; completed 5th grade; on Apr 1 1935 was living in the same place/city; attended school. 1930 census, 11th Ward, Wilmington, New Castle County, Delaware; roll T626-288, ED 68, page 14A, line #13, dwelling #169, family #175. 1940 census, 7th Ward, Wilmington, New Castle County, Delaware; roll T627-550, ED 4-42, page 9A, line #32, household #210. Ancestry Family Tree data "DILL Family Tree" posted by "Traceykane1". 1910 census, 5th Ward, Vincennes, Knox County, Indiana; roll T624-360, ED 80, page 2B, line #34, dwelling #45, family #45. 1920 census, 8th Ward, Hazelton, Luzerne County, Pennsylvania; roll T625-1593, ED 80, page 3B, line #77, dwelling #58, family #72. Ancestry Family Tree data "Hardy/McEnaney 2012" posted by "mmhardy_1" (Michael Brian Hardy). 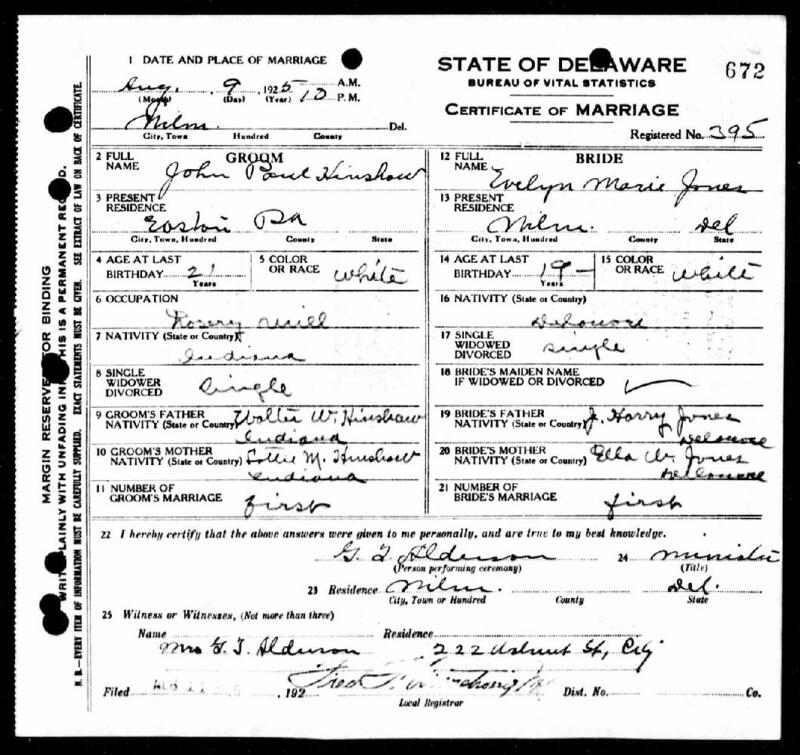 Delaware Marriage Records, 1806-1933; http://www.ancestry.com. Ancestry Family Tree data "laptop family_AutoBackup" posted by "billkevans".